A recent study by Points North Group found that many big-name brands partnered with paid influencers who had a hefty fake-follower presence. Procter & Gamble, the world’s largest advertiser, had two brands ranked among the top 10 in using paid influencers with fake followers. The data show, according to Ad Age, “that Pampers and Olay ranked No. 4 and 10, respectively, on the list of brands with the most fake followers among their paid influencers last month; Pampers with 32 percent and Olay with 19 percent. Topping the study’s list: Ritz-Carlton, with a whopping 78 percent of fake followers for its influencers.” 78 percent! Indeed, going after reach and only reach is not recommended. When assessing the value of paid influencers, it’s important to factor in how much genuine interaction these influencers are receiving from followers. Even then, brands and agencies must weed out bot accounts that are created to post comments in an attempt to feign engagement. Facebook will expand its pre-roll ad format, offering advertisers more places on the platform to run ads. 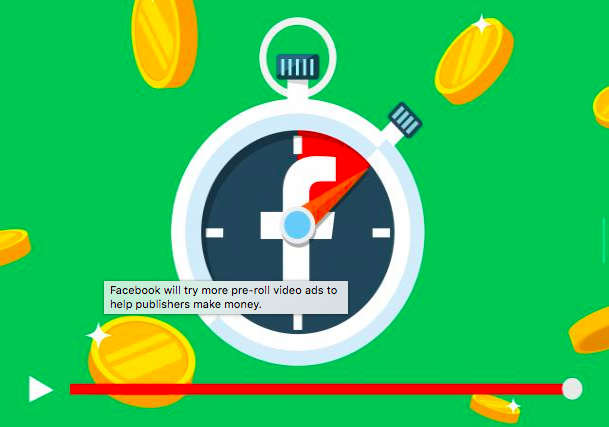 Facebook announced the news Friday in a blog post about “best practices and updates on video and monetization.” Pre-roll ads, which are ads that run ahead of videos, are a format once banned by CEO Mark Zuckerberg himself, according to Ad Age. Snapchat, the market leader in augmented reality lenses, announced it is launching Shoppable AR Lenses that allow advertisers to add a “Buy,” “Watch” or “Install” button to branded lenses — turning every branded Snapchat selfie into a potential purchase, video view or app download. More than 70 million people play with Snapchat Lenses every day, resulting in 250 million AR Snaps daily. This scale and reach, combined with Shoppable Lenses is a great way for brands to drive real and measurable ROI, whether that’s through sales, downloads, or video views. 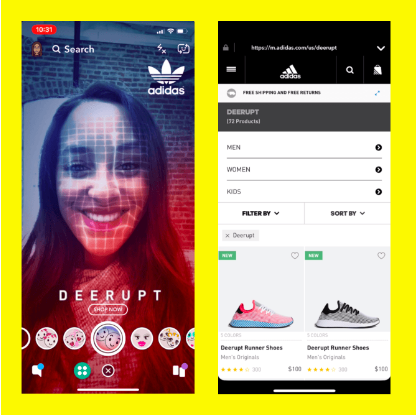 Since launch, Adidas has already created a Buy Shoppable AR Lens for its Deerupt running shoes; the Lens takes users directly to the product page on the Adidas website to purchase the shoes. Clairol and King are utilizing the Install Shoppable AR Lens to drive app installs of their games, and STX Entertainment are launching with the Watch Shoppable Lens to promote its new Amy Schumer movie, “I Feel Pretty.” That Lens drives users to the full-length trailer. We are looking forward to seeing how performance looks for these launch partners and to see how other brands will adopt this new Snapchat feature. 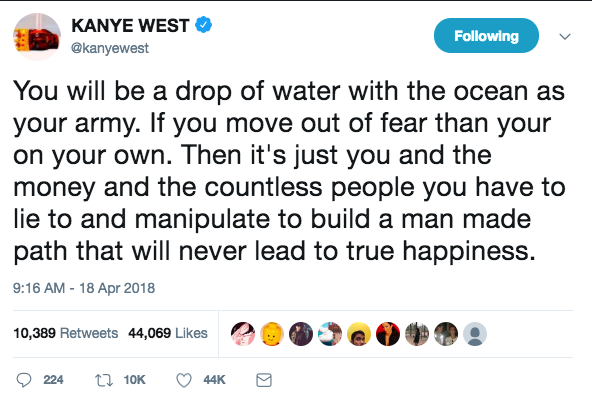 Do you remember the simpler times, when Kanye West would tweet regularly about silly topics like the conundrum of waking up on a plane next to a water bottle that doesn’t belong to you? Unfortunately, we’ve been deprived of Kanye’s bizarre and sporadic inner thoughts since May 2017, when he appeared to deactivate his Instagram and Twitter accounts. In fact, he’s been largely under the radar after a high profile mental breakdown in the fall of 2016, which resulted in the cancellation of his Saint Pablo tour. Luckily for us, the rapper’s one-year Twitter hiatus officially ended on Friday, April 13. He’s been pumping out nearly ten tweets a day, ranging from philosophical musings to Yeezy fashion line updates to gushing about driving his Tesla. Some speculated, and rightly so, that Kanye’s prolific return to Twitter was just a stunt to promote upcoming music releases. These suspicions were confirmed when he tweeted about two albums set to arrive this summer: his own album, slated for release on June 1, and another album created with fellow rapper Kid Cudi and other artists on June 8. As of the writing of this post, Kanye is still going strong and will undoubtedly keep us all guessing as to what he’ll tweet about next.